This means that Mortech is constantly evaluating new products to support on our pricing engine. For example, a lot of young borrowers with student loan debt may be looking to lower their monthly payments or consolidate. 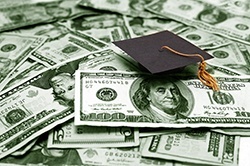 With the Student Loan Cashout product from Fannie Mae, lenders can offer something to borrowers that allows them to use some of the equity in their home to pay off student loan debt, thus incentivizing them to refinance, even in an environment where rates are increasing. Around 44 million Americans are averaging $34,000 in student loan debt. As a result, Fannie Mae is focusing solutions on those impacted by student loan debt to help lower their monthly payments. If a borrower has 20 percent or more equity in their home, and they’re paying off a personal student loan, Fannie Mae will waive the loan-level price adjustment. As more borrowers with student loans begin the process of home buying and start to look into options that will work best for them, a Student Loan Cashout could be the difference between getting their business and losing it. Another product, and similar to the Student Loan Cashout is the Texas Cashout. Texas is a little different than other states when it comes to property rights, with unique home equity laws in their state constitution. However, this past November, Texans voted to update these laws with proposition 2, the Home Equity Loan Amendment, which loosened some of the restrictions of the previous laws. With this new proposition, Texans can now refinance their existing loans that fell under this section into non-home equity loans. Not only that, but the proposition also updated the home equity line of credit restriction to 80% of the home value. With Texans looking to take advantage of this new proposition, lenders that have access to that product will be one major step ahead. Luckily, the Student Loan Cashout and the Texas Cashout are both available in Marksman for our users to utilize. As laws change and new opportunities become available for borrowers, we’re always making sure to add the best products into our pricing engine for our lenders. We believe that providing the right tools and products for our users allows them to not only better their business, but better the lives of their borrowers. Want to find out more about our products and what we can offer you? Reach out and talk with us today.